The V International Conference of the Institute for Biocomputation and Physics of Complex Systems (BIFI) will take place on February 1-4, 2012. 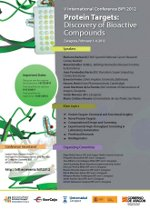 The meeting will be an international conference on Drug Discovery from a protein perspective, covering most of the initial steps in drug discovery and preclinical studies (new protein targets, protein target validation, new methodologies and tools for structural and functional characterization, experimental and computational high-throughput screening, etc.). We wish the conference to represent a venue for gathering active researchers on drug discovery, with strong roots in the scientific and academic communities to discuss recent developments and future challenges in the field.